Israel and militant Palestinians are locked in deadly battle in the Middle East, but Iran poses the biggest challenge in the region to the incoming Obama administration, President George W. Bush‘s national security adviser says. At the same time, the Mideast offers President-elect Barack Obama the greatest opportunity to put his imprint on world affairs, Stephen Hadley said, referring to the need for a lasting Israeli-Palestinian peace accord that eluded both Bush and former President Bill Clinton. Outside the Mideast, it is Pakistan that should command Obama’s keen attention, said Hadley, who has been senior foreign policy adviser to the president for eight years. Hadley, who is always in the shadows and rarely seen by the public, discussed Bush’s two terms and the international challenges — ones he says will not pause for America’s transfer of power in January — during a nearly hourlong interview Tuesday with The Associated Press in his West Wing office. He was also delivering a speech Wednesday at the Center for Strategic and International Studies. He said the Taliban remains a serious threat in Afghanistan, where the U.S. is getting ready to dispatch at least 20,000 extra troops. President Workout: Front Page News or Pure Tabloid? Ah, the perks of media affection. On Christmas Day, The Washington Post delivered a Page One paean to Barack Obama‘s workout habits. The 1,233-word ode to Mr. Obama’s physical fitness read more like a Harlequin romance novel than an A-1 news article. Sighed smitten reporter Eli Zaslow, “The sun glinted off chiseled pectorals sculpted during four weightlifting sessions each week, and a body toned by regular treadmill runs and basketball games.” Drool cup to the newsroom, stat. And when Mr. Obama feels better, the skies will part, the sun will shine (in moderate, environmentally correct, non-global warming-inducing amounts, of course), and peace will reign worldwide! George Bush and Condoleezza Rice failed. Numerous heads of the United Nations have failed. Palestinian and Arab leaders have failed. Now maybe Barack Obama will inherit the Middle East peace process like many before him. With less than a month until the inauguration, the U.S. president-elect could inherit a Middle East in international crisis — and it will be his to fix or suffer through. The death toll from a weekend of Israeli airstrikes on Gaza has topped 300, Palestinian medical sources said Monday. Israel’s air assault began a third day amid wide ranging condemnation from the international community. The United States has always been Israel’s number one ally: but with a new president to take office on January 20, 2009, new policy is being formulated in the U.S. that involves Israel now…. The deaths of hundreds of Palestinians in Israel‘s deadliest-ever air assault on Hamas further complicate President-elect Barack Obama‘s challenge to achieve a Middle East peace — something that eluded both the Bush and Clinton administrations. The Bush administration has blamed the renewed violence on the militant Islamic group Hamas, which controls the Gaza Strip, saying it broke a cease-fire by firing rockets and mortars deep into Israeli territory. The Arab world, however, has reacted with rage to the aggressive Israeli counterattacks, which have left at least 290 Palestinians dead and more than 600 wounded. It’s unclear whether Obama will be as supportive of Israel as President George W. Bush has been. 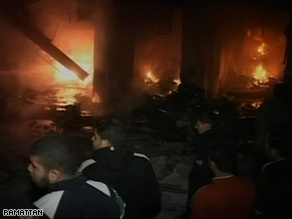 Fire burns late Sunday or early Monday in Gaza, where Israel has been bombing what it says are Hamas targets. David Axelrod, senior adviser to Obama, chose his words carefully Sunday, saying the president-elect would honor the “important bond” between the United States and Israel. Israel had been carrying out its attack exclusively from the air, but the Israeli Cabinet has authorized the military to call up 6,500 reserve soldiers for a possible ground invasion. Pakistan‘s decision to relocate thousands of troops away from the Afghanistan border toward India threatens the critical U.S. foreign-policy aim of relying on the South Asian ally’s military in the global battle against terrorism. President-elect Barack Obama’s campaign promise to turn around the stalemated war in Afghanistan could be the first casualty of Pakistan’s latest moves, and the frustrated American effort to crush al Qaeda may be the second. Pakistan’s sudden military shift catches two administrations in mid-transition, presenting Mr. Obama with a dangerous spike in tension that his predecessor has been unable to prevent. As President Bush found out, the United States can’t wage either fight alone and can’t always persuade even well-meaning allies to set aside their own agendas and domestic politics. To win in Afghanistan rather than merely hold ground, the United States and its allies must find a way to seal off the militants’ redoubts across the forbidding mountainous border with Pakistan. The U.S. can’t do that without Pakistan’s help, and Pakistani and Afghan militants know it. Bush administration officials have been shuttling to New Delhi and Islamabad for weeks following the terrorist attacks in Mumbai, pleading with both sides not to let well-founded suspicions that the attacks originated in Pakistan become an excuse for new conflict. India and Pakistan have fought three wars, and enmity against the other has been an organizing principle for leaders of each nuclear-armed country. If Pakistan yanks fighting forces away from what the U.S. considers the good war against terrorism in the tribal areas bordering Afghanistan, it will bear out U.S. fears of a ripple effect and show how easily militants can exploit the old rivalry. “We hope that both sides will avoid taking steps that will unnecessarily raise tensions during these already tense times,” White House spokesman Gordon Johndroe said Friday. Adm. Michael Mullen, chairman of the U.S. Joint Chiefs of Staff, was in Islamabad last week, after noting with approval earlier this month that neither side seemed to have mounted a military response to the Mumbai terrorism. Within hours of Barack Obama’s election as President of the United States a kind of Slavic chess tournament opened in the Kremlin to defeat the new American president. Whether it is because he is Black or for whatever reason (and we might not know the Russian reason exactly for some time) Russian President Dmitry Medvev and his predecessor, mentor and Foreign Minister Vladimir Putin, began to pressure, cajole and coerce Mr. Obama. The chess pieces include the U.S. missile defense plan for Europe, which includes ten or so interceptor missiles and a radar site, both in Poland and the Czech Republic. Russia wants to checkmate these and get them off the European (and Kremlin) chessboard. Putin and Medvev have as kings nuclear weapons of their own. The day after Obama’s election, in an opening move, Medvedev offered to really provide a geographic move of short range nuclear-tipped Iskander missiles closer to Eastern Europe. Medvedev backed off this idea largely due to world-wide condemnation at his dangerous bluster. Today Russia says it will stop developing “some” strategic nuclear weapons if the U.S. halts it European missile shield plan. This seems to us at Peace and Freedom to be a play by Russia to guarantee future Russian superpower status. Eastern European (and former Soviet) nations like the Czech Republic and Georgia are gravitating toward the West and NATO, and Russia cannot accept their loss. That’s why Russia invaded Georgia and South Ossetia last summer…. Vladimir Putin is a world-class chess master at getting what he wants. The former KGB man now seems poised to return to the presidency of Russia for another term in a few years and he seems to have convinced many, by deception, that missile defenses in Europe are a threat to Russia. What Putin wants is control of Russia — and a Russia of long term dominance on the world stage. Conceived way back during the Ronald Reagan presidency and often derisively called “Star Wars” or the missile shield, U.S. missile defense is no threat to Russia or anyone else. Like a defensive basketball or football player, missile defense is designed and used to block destructive attacking missiles from reaching their goals. Russia has manipulated the world media for almost two decades to create the illusion that missile defense is some threat to Russians. In fact, no missile defense missile has the capability of harming Russia or Russians: the “kill mechanism” of a missile defense interceptor is the kinetic energy or crashing into the attacking missile. The missile defense missile has no warhead — unlike intercontinental ballistic missiles that can carry 10 or so nuclear warheads, each capable of annihilating millions of people and entire cities. The U.S. missile defense effort for Europe has been a long and painstaking discussion going back two decades. Along with thousands of others, I participated myself in these discussions, forums and conferences, in the early 1990s, on two levels: first as co-chairman of a NATO study (one of several) to determine the efficacy and implications of a European missile defense to stop missiles like those being developed by Iran targeted on Europe; and then on U.S. government missions to Moscow to show with credible evidence that a U.S. missile defense was no threat to Russia — or anybody. By the middle 1990s, the Russians seemed to agree that U.S. missile defenses, even in Europe, were no threat to Russia or Russians. In 2002, the United States, after years of notification to Russia and discussions with Russia, withdrew from the 1972 Anti-Ballistic Missile (ABM) Treaty which had been made with the Soviet Union. This action was necessary to permit testing of U.S. missile defenses — which had targets and interceptors that could have posed an international legal discussion vis-a-vis the treaty. Then an interesting thing happened. Vladimir Putin in Russia decided that he wanted a resurgent Russia with renewed superpower status, like that enjoyed during the Cold War Soviet era. As Russia developed its oil reserves, exports gave him the financial clout he needed despite an aging and creaky military machine. But an expert at media and public manipulation, Putin went to work to achieve his goals and to stifle U.S. objectives on many fronts. The suave, handsome and articulate Mr. Putin and Mr. Medvedev are also quick to reveal clumsy bluster and intimidation — which is what the recent threat to move Iskander missiles closer to Poland seems to have been. Russia also attacked neighbors in Georgia and South Ossetia — quickly turning ignored intimidation into acts of war. Russia continues a very aggressive trade relationship with Iran, which continues to develop more capable ballistic missiles, nuclear technology (with Russian help) and sends verbal assaults at least weekly at Israel and the U.S. (”Israel should be wiped from the map,” said Iran’s President Ahmadinejad). Efforts to slow or stop Iran’s nuclear development in the United Nations are routinely thwarted by Russia and China. The fact is that U.S. missile defense threatens nobody — with missiles incabale of landing on Russian targets and without warheads. The U.S. has even offered Russia the opportunity to place Russian inspectors at U.S. missile defense sites, 24 hours a day and 365 days a year to ensure no sneaky bad guys alter these defensive systems for attack. The difficulty of converting a missile defense system for attack is, well, like secretly and quickly rerouting the Space Shuttle from a mission to the International Space Station and then attempting a manned landing on Mars. Russia knows this is a crazy notion — but many in the media and others have swallowed this brainless Russian borscht. NATO Secretary General Jaap de Hoop Scheffer called the Russian remarks on moving missiles in Europe unsolicited, unnecessary and unhelpful. Russia has also said that a missile defense system in Europe will “negate” its thousands of nuclear armed missiles. But the European missile defense system is only intended to have 10 interceptors — which would be easily and quickly overwhelmed by a Russian attack. Threating people in Europe with nuclear destruction is a gossly over the top Russian act of instigation and intimidation — and it makes no sense in the post-Cold War world. Medevev and supposedly Putin have now backed away from their threat to move Iskander missiles but they have created an incredible fog of lies in the air — which many in the international media and elsewhere have swollowed. U.S. missile defense, and the European effort with Poland and the Czech Republic, is no threat to Russia or anybody else. It is a system to bat down incoming nuclear warheads from long-range missiles, like those Iran continues to test. What do the financial crisis and US Middle East policy have in common? Behind the financial crisis was a well-practiced mechanism for concealing risk. The risk was there, and it was constantly growing, but it could be disguised, repackaged and renamed, so that in the end it seemed to have disappeared. Much of the debate about foreign policy in the United States is conducted in the same manner: Policymakers and pundits, to get what they want, conceal the risks. In the case of the Middle East, they concealed the risks of bringing Yasser Arafat in from the cold; they concealed the risks of neglecting the growth of al-Qaida; and they concealed the risks involved in occupying Iraq. It isn’t that the risks weren’t known. The intelligence was always there. But if you were clever enough, and determined enough, you could find a way to conceal them. But concealed risk doesn’t go away. It accumulates away from sight, until the moment when it surges back to the surface. It did that after Camp David in 2000, when the “peace process” collapsed in blood; it did that on 9/11, when hijackers shattered the skies over New York in Washington; and it happened in Iraq, when an insurgency kicked back. This tendency to downplay risk may be an American trait: We have seen it in US markets, and now we see it in US election-year politics. In Middle East policy, its outcome has been a string of very unpleasant surprises. A CASE in point is radical Islam. One would think that after the Iranian revolution, the assassination of Anwar Sadat, the terrorism of Hizbullah, the Rushdie affair, the suicide attacks of Hamas and al-Qaida, the Danish cartoons and a host of other “surprises,” we would not be inclined to ignore the risks posed by radical Islam. And yet there are batteries of interpreters, analysts and pundits whose principal project is to obscure if not conceal those risks. Here are some of the most widespread variations on the theme: Worried about Ahmadinejad? Pay him no mind. He doesn’t really call the shots in Iran, he’s just a figurehead. And anyway, he didn’t really say what he’s purported to have said, about wiping Israel off the map. What the Iranians really want is to sit down with us and cut a deal. They have a few grievances, some of them are even legitimate, so let’s hear them out and invite them to the table, without preconditions. Iran isn’t all that dangerous; it’s just a small country; and even their own people are tired of the revolution. So pay no attention to Ahmadinejad, and pay no attention to the old slogans of “Death to America,” because that’s not the real Iran.